I love the effects of self-striping yarn. The idea behind it is you can have a garment that looks like you've used several different yarns, but it's all one long piece of yarn so there are no ends to sew in when you are through. The only downside is self-striping yarn is expensive. It's great for making striped socks. It's not the same as ombre yarn because the colors happen in random order. Thanks for posting a photo. That's helpful. You Dad sounds like a vanilla kind of guy. I'm glad you knit for him. There is something special about that. I have seen this in the store, but I am skeptical of it. How do the stripes work out when we would sometimes be making items of different sizes? I can't see how it wouldn't get thrown off and not actually make stripes sometimes. On the other hand, I hate to change yarn colors and so I almost exclusively make solid color items. I use a little bit of varigated (sp?) to add in some color. Sometimes I'll do that in the border of a solid color aphgan. But I can't stand changing to a bunch of different yarns in a project. I can see how excited you got there for a moment. Are you yearning to knit? Is your Fruedian slip showing? I've made some doozy typos. I sure wish they'd provide an edit button. Or an proofreader to stand behind me. I've never heard of this type of yarn before. Interesting. thanks for the look see. Does larger project come out in stripes or more varigated? 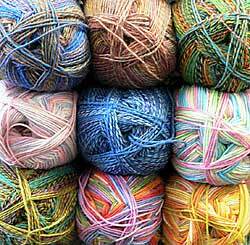 It totally varies based on gauge, needle size and how long the colors go for on that particular ball of yarn. I like it because it's unpredictable, but some people may not like it because they never know what they are going to get. I assume you need to knit with a specific needle size and a specific amount of stitches. No, I just let kismet take it's course. Whatever happens happens. Try some knitting serendipity.